Space weather is a branch of space physics and aeronomy that describes the space environment between the Sun and Earth. Space weather is highly influenced by extreme solar activity such as solar flares, coronal mass ejections (CME), and etc. When major eruptions occur on the Sun’s surface, it can emits huge amount of electromagnetic radiations and high energetic particles to the space and Earth environment. The radiations and particles could impact the Earth environment including the magnetosphere, ionosphere, thermosphere, exosphere and humanosphere. 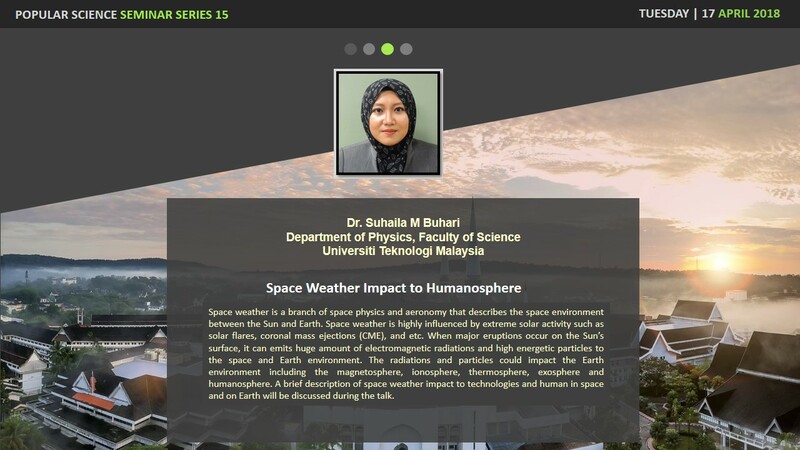 A brief description of space weather impact to technologies and human in space and on Earth will be discussed during the talk.